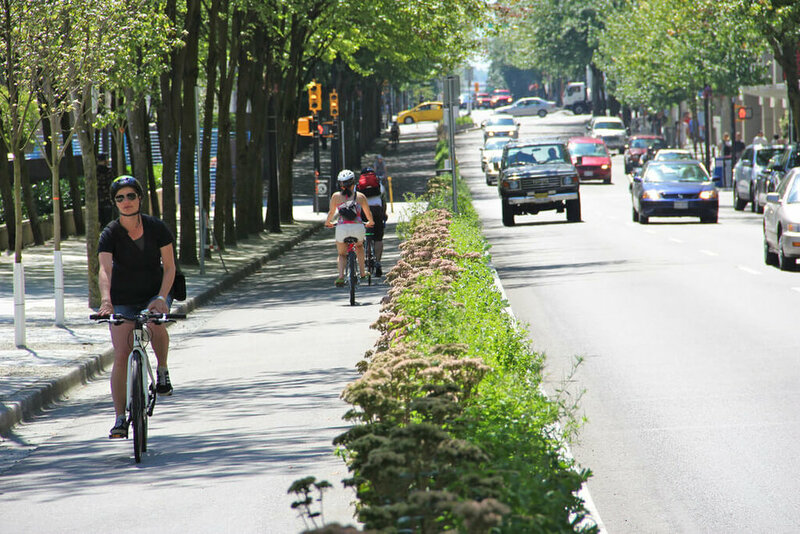 Shared-Use Paths provide the most comfort for more bicyclists as the path is largely independent from the adjacent roadway and separated by established swales, landscaping and available off-street parking. However, conflicts with pedestrians and slower bicyclists often keep more experienced riders away from these facilities. 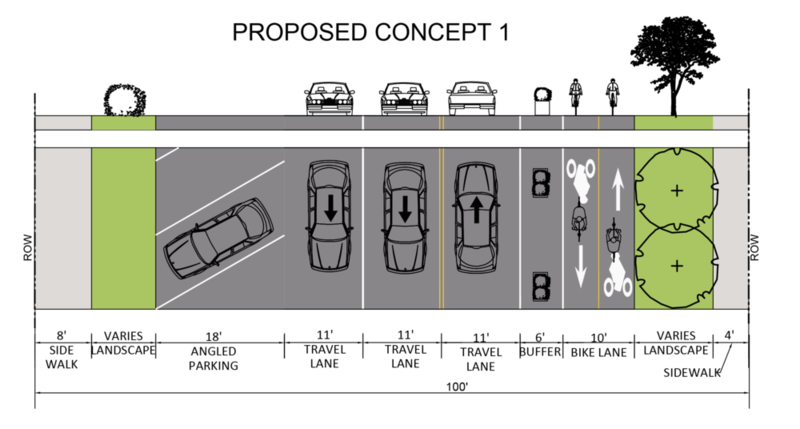 Separated bike lanes also enable a low-stress bicycle experience by establishing a buffer between the bike lane and motor vehicle. Buffers are typically a minimum of three feet and can accommodate landscaping and planters. Parking protected bike lanes are a type of separated bike lane where parked vehicles provide added protection from motor vehicle traffic for people riding bikes. This five to six foot wide bike lane incorporates a three foot wide buffer between the bike lane and the parked cars to provide for open car doors. 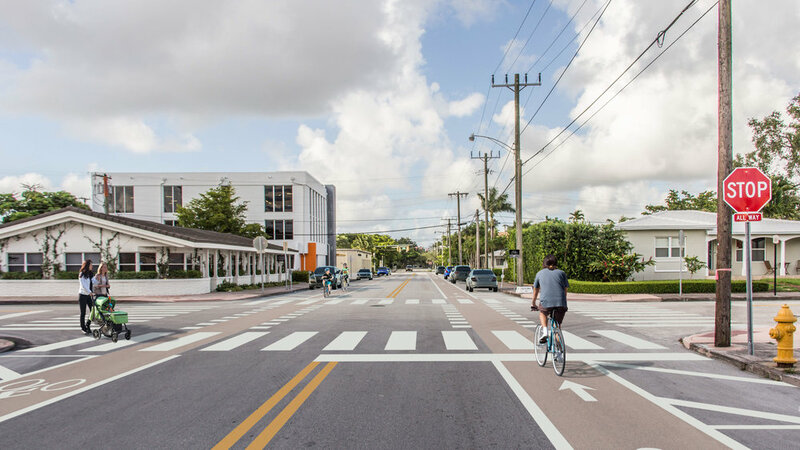 Bicycle Boulevards are bicycle facilities that utilize low traffic-volume streets enhanced with traffic calming measures to more closely equalize the speed of bicycles and motorized vehicles. This photo is taken on Riviera Drive north of Bird Road, looking south. 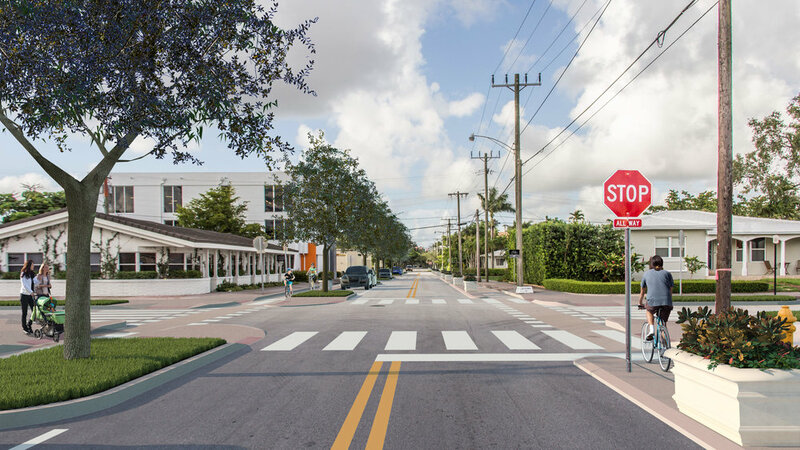 It is used to illustrate the residential portions of the Gables Greenways plan. The roadway is typically 24' to 26' wide with one travel lane in each direction. Intermittent 4' to 6' sidewalks exist along both sides of the street, separated by a wide grass buffer lined with trees. Bikes currently either share the road with fast moving traffic, or share a narrow sidewalk with pedestrians. Not all residential streets share this condition, and therefore different parts of the network could have different solutions. 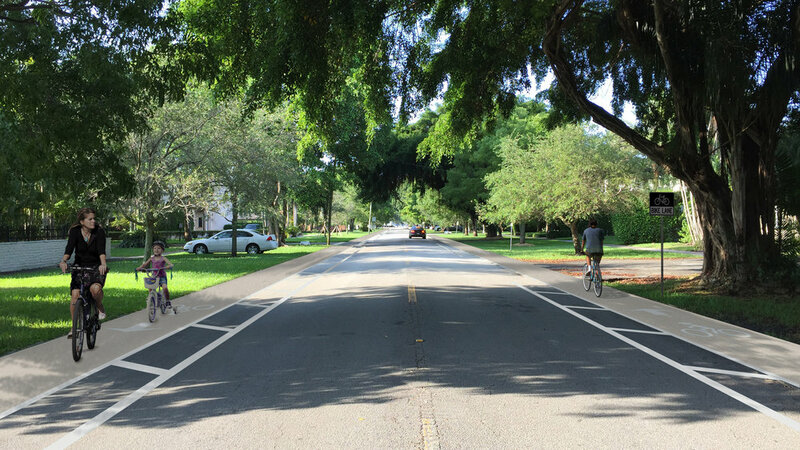 Installing conventional bike lanes requires minimal road widening (2' to 3' on either side). Conventional bike lanes, however, provide minimal separation from traffic. Installing buffered bike lanes requires some additional road widening (5' to 6' on either side). A painted buffer provides separation from traffic. 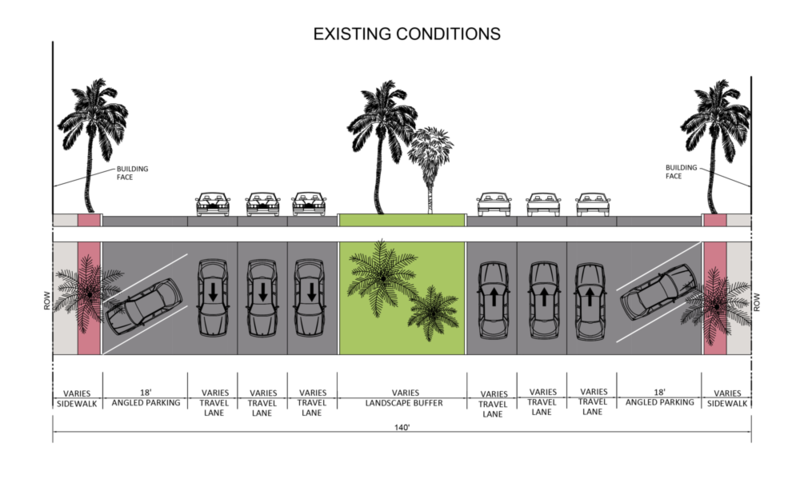 To install separated bike lanes the roadway is narrowed to 20', while a 3' grass buffer separates the bike lane from traffic. Landscaping can be planted in the grass buffer to provide additional comfort for bicyclists. 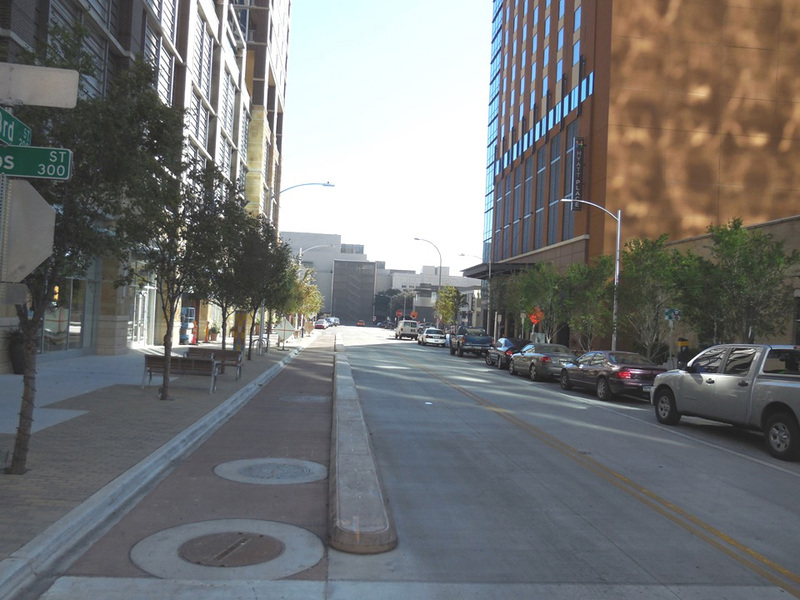 Installing a shared use path leaves the roadway in its existing conditions. A 12' shared-use path replaces the sidewalk on one side of the road, where bicyclists in both directions share the space with pedestrians away from traffic. This photo is taken on Salzedo Street looking south toward University Drive. 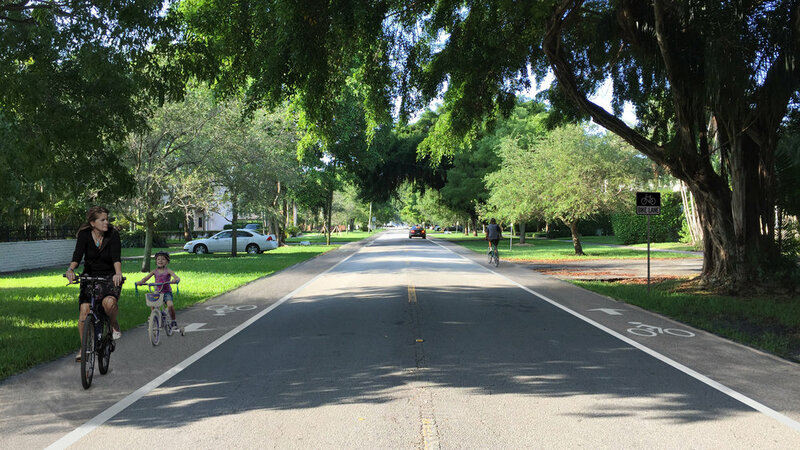 It is used to illustrate the downtown portions of the Gables Greenways plan. The roadway through this area is typically 43' wide and has one travel lane in each direction with parallel on-street parking on both sides of the street. Other parts of this corridor have two lanes in each direction and no on-street parking. The lack of street trees creates a hot and barren environment. 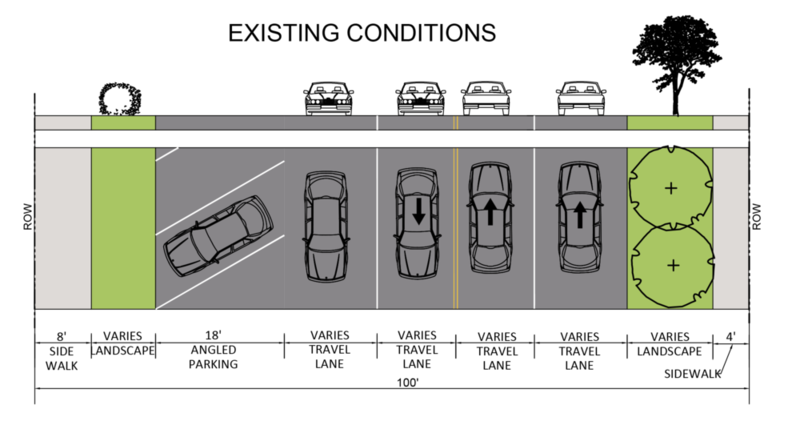 To install separated bike lanes, parking is consolidated to one side of the street, and the vehicular travel lanes are narrowed to 10'. The bike lane on the side where parking has been removed is separated from the vehicular travel lanes by a painted buffer and concrete planters. A parking-protected bike lane is installed on the other side of the street. The parking-protected lane is separated by parked cars and concrete planters. 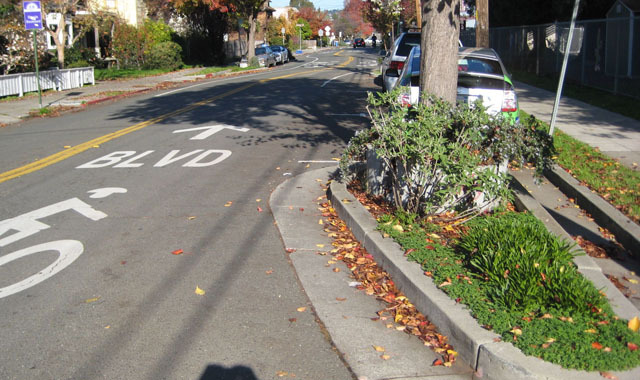 A 3' buffer separates the lane from parked vehicles in order to provide enough room for car doors to open outside of the bike lane. In the permanent condition, new curbs replace the painted buffers, and street trees are planted in between parking spaces. 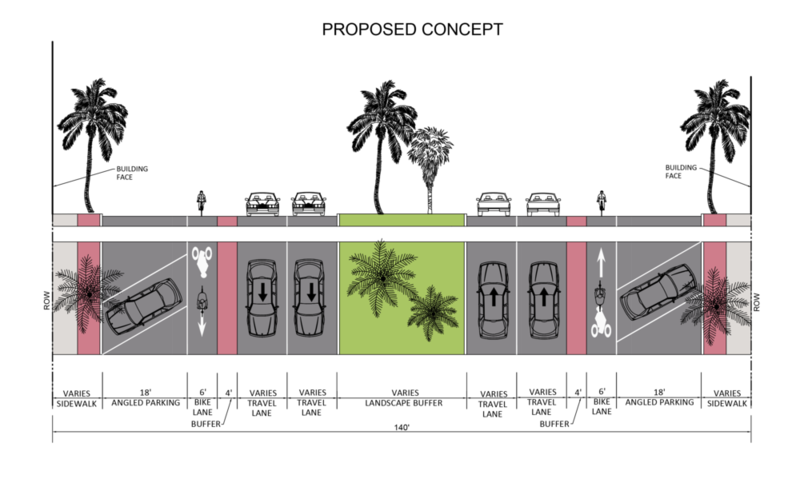 To install a separated cycle track, parking is removed on one side of the street and the vehicular travel lanes are narrowed to 10'. The space where the on-street parking is removed, is replaced by an 11' two-way cycle track, separated from traffic by a painted buffer and concrete planters. 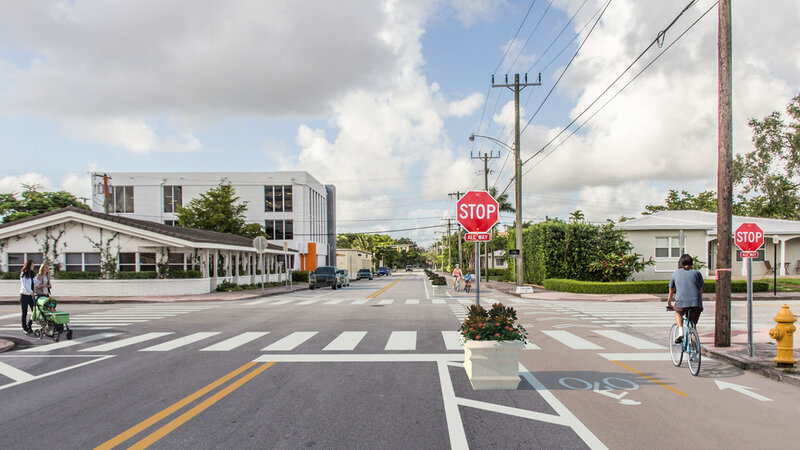 In the permanent condition, the painted buffer with planters is replaced by a planted median with street trees. On the other side of the street new bulb-outs are installed with street trees planted in between the parking spaces. 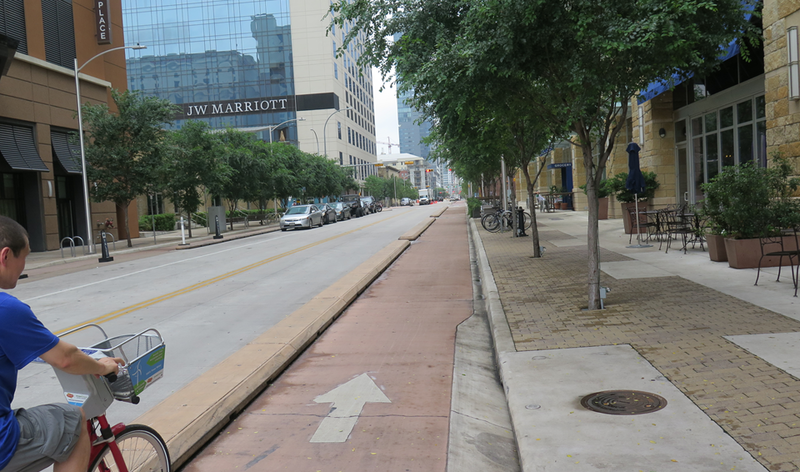 Conventional bike lanes are installed by narrowing the vehicular travel lanes to 9.5'. This provides just enough room to install a 5' bike lane directly adjacent to the parallel on-street parking lane. This configuration manages to preserve on-street parking on both sides of the street by opting for a design solution that leaves bicyclists sandwiched in between moving traffic and parked cars. Car doors open directly into the bike lane. In the permanent condition, bulb-outs are installed on both sides of the street with street trees planted in between the parking spaces.